There’s no need for expensive, high-tech materials to test your engineering skills—you probably have all you need in your home junk drawer. 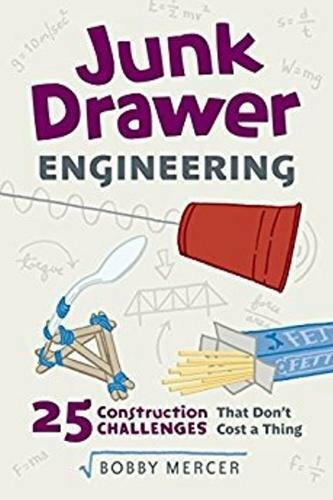 Each hands-on project in this book will challenge you to come up with a unique solution to a specific design problem. Construct a Pasta Bridge strong enough to support a heavy load, using only dry linguini and glue. Build a Marble Roller Coaster from recycled cardboard tubes, in which the marble “car” jumps a track to land safely at its final destination. Or design an Egg Catch device to safely capture a free-falling egg. Test yourself or use them for friendly competitions—who can come up with the best solution? These 25 open-ended design challenges can be performed for just pennies . . . or less. Each project has a suggested materials list, step-by-step instructions with illustrations for one possible solution, and suggestions on how to adapt each challenge for different ages and skill levels. Educators and parents will find this title a handy resource to teach children problem-solving skills and applied physics, all while having a lot of fun. Real science and problem-solving become just plain fun! If you have any questions about this product by Independent Publishers Group, contact us by completing and submitting the form below. If you are looking for a specif part number, please include it with your message.